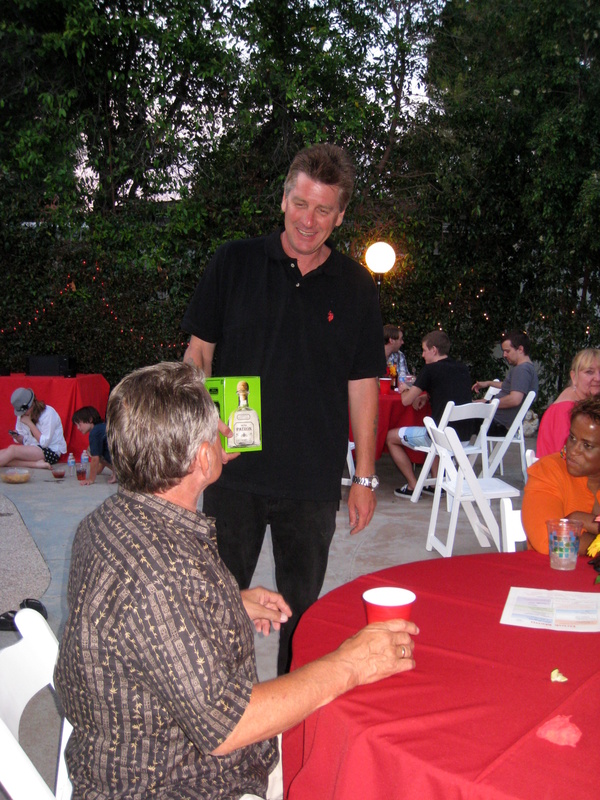 June 2, was date of a 50th birthday party in the exclusive San Fernando Valley hamlet of Sherwood Forest (formerly, Northridge). My clients went all out and decorated the backyard pool area to create a memorable event for the birthday girl. I brought a server, Katie (who has worked with me several times) to help with the food, while I manned the bar. 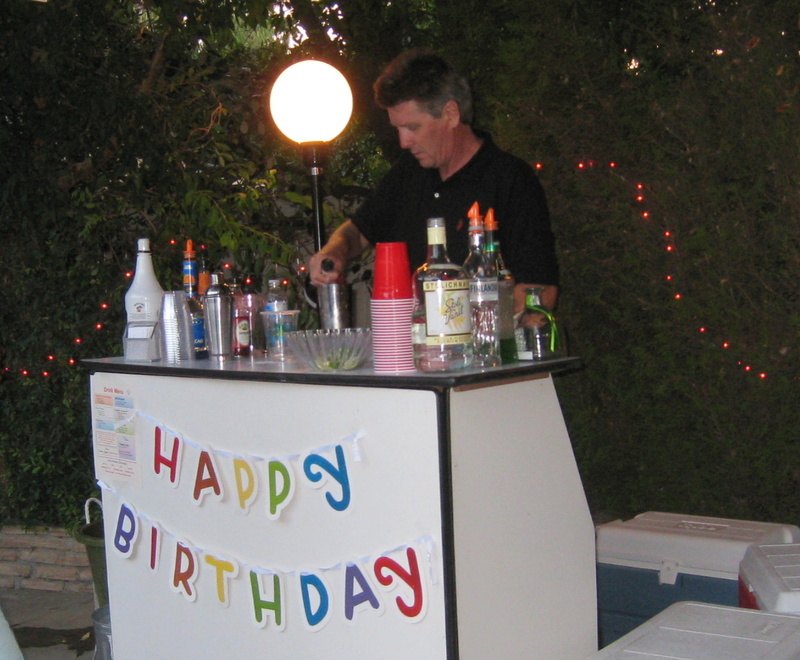 Our client rented a bar, tables and chairs from a party rental company. It’s always nice to have a real bar as opposed to a table set up, and makes me think I need to get one, but then I would need a truck to haul it in. In reality a table works fine and in the end the guests don’t really care where their excellent drinks come from. I’ve never called myself a “mixologist”, I’m old school and that word seems a little pretentious, but I was the hired mixologist of the night. I’ll take it. The host came up with an excellent drink menu. I served Margaritas, Cadillac Margaritas, Bay Breezes, Cosmos, and a couple of specialty drinks that were favorites of my clients. The most popular cocktail of the night was the Island Breeze: Malibu rum, Blue Curacao, and pineapple juice, garnished with pineapple and a cherry. Shock Top and Corona Light were the beers of the night. Arnold Palmers were the non-alcoholic drink of choice. The guests dined on Mexican food from a local restaurant and deserts made by the host. Overall, the party seemed to be a smashing success. The forecast called for triple digit weather, but as the sun went down the weather was perfect for backyard partying. 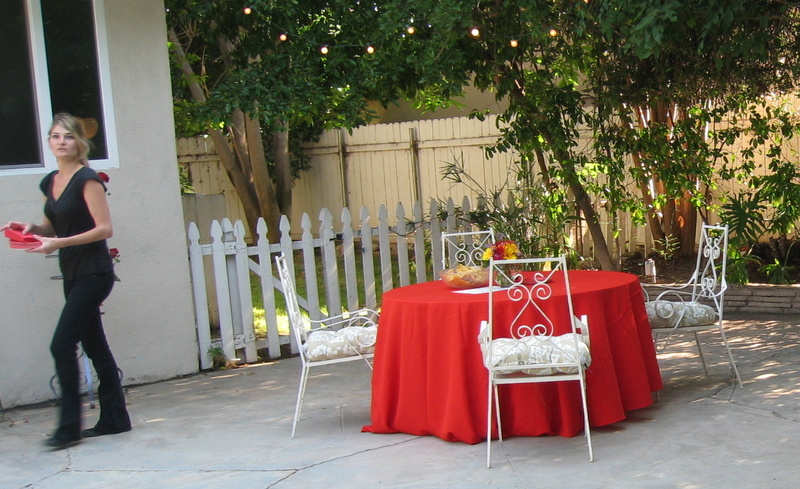 Plan your summer party today and let us help you. Shaken Not Stirred serves the San Fernando Valley, the LA Basin, and pretty much the whole Southern California area. We’ll go anywhere in the world if the price is right! Now that I’m a mixologist, I’m sure I can get gigs in Europe, South America, the Far East, and Down Under. Seriously, Shaken Not Stirred is serious about summer birthday parties, weddings, pool parties, class reunions, openings, and all other events. Several dates in July are already booked, but I have many skilled bartenders available. Call or email for rates and availability. I had two last minute calls yesterday and couldn’t fill them on such short notice, but don’t hesitate to call, because sometimes I can. My wife and I have thrown parties a number of times for 25 to 35 friends and relatives. The only problem with a group this size is that as a host you end up spending all your time waiting on everyone; you get little time to socialize and party with the guests. I wanted to avoid this when I was planning my wifes 50th birthday bash. Found Rob, and he and Katie accomplished exactly what we needed them to do – keep our guests served in order to free us up to mingle and enjoy the party. All my guests commented on what a good job they did, what nice people they were, and how well they seamlessly blended into our group. I definitely will hire them again the next time we throw a party this size (which we no doubt will do). Well done Rob! Thanks so much, Michael – it was a pleasure!